Definition: Torsion springs are tightly coiled round wires with straight wires coming off the ends which make the legs of the torsional spring. 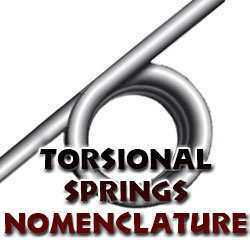 Another term used for torsion springs. The direction in which your spring’s coils are wound. Learn how to determine the direction of wind using the diagram to the right. The angle of your spring’s legs in a free state. Measurement of the width of the coils that make up the torsion spring’s body. Measurement of the hole inside the spring’s coils formed by its helical shape. The medium or intermediate diameter between the outer and inner diameter. Calculated by adding one wire diameter to the inner diameter or subtracting one wire diameter from the outer diameter. The proportional ratio between a spring’s wire diameter and mean diameter. It describes the tightness of the spring’s coils. The body length is the measurement of the body’s height. You may calculate the body length by multiplying the total coils by the wire diameter and adding one additional wire diameter. The length of your torsion spring’s legs, staring from the center of its outer diameter. You can measure the leg lengths from the outside of the outer diameter and then add half of the outer diameter to that measurement. This means that both legs are the same length. The total amount of active coils in a torsion spring that’ll work together to fulfill your torque and deflection requirements. The constant amount of force it will take the spring to travel one degree at a time. The constant amount of force it will take the spring to travel 360 degrees. Angle of the position of the spring’s legs when a load is applied. The angular motion in which a torsional spring is torqued or rotated. The degrees of travel are calculated by subtracting the torqued position from the free position. The weight or force being applied on the spring’s legs in order for it to reach a torqued position. The maximum amount of torque your spring will be able to undergo before taking a permanent set. The maximum amount of angular travel or deflection your spring is able to achieve before taking a permanent set. Maximum Stress at which your extension spring will perform indefinitely without failure for a given minimum stress limit. The product of exceeding the elastic properties of an extension spring thus keeping it from returning to its original unloaded length once the load has been released.